Few of us work in isolation, so ensuring your team works well together is essential. A good team has an inclusive approach where every member feels valued and individual skills are recognised. Team working has always been a core skill for healthcare professionals, and with collaborative working very much part of NHS chief executive Simon Stevens’ Five Year Forward View, it has become even more integral to the job.For Hays Healthcare director Simon Hudson working on improving your team player skills is key to the goal of providing an excellent service. Know and use the strengths of your team. Work with the team to improve services. Listen to your team and all those around you. Respect your team and the contribution they make to the service you are working to provide. 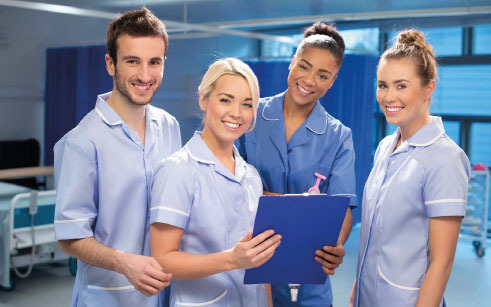 A good nursing leader should have the skills of others uppermost in mind, agrees Nick Simpson, chief executive of healthcare recruitment specialist MSI Group. Failing to work collaboratively can have an adverse effect on patient safety, with potentially disastrous consequences. ‘We have all heard horror stories of NHS never events,’ says Mr Simpson. ‘But the chances of making such mistakes are reduced by everyone following procedures and communicating effectively.